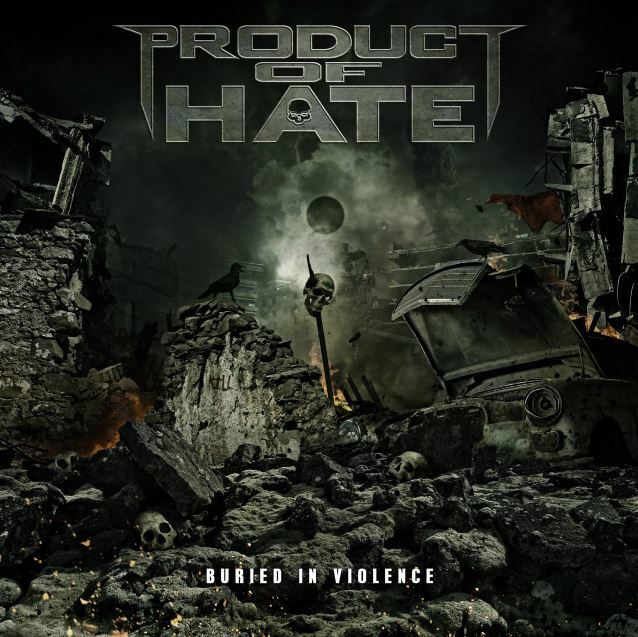 On Friday groove metal band Product of Hate dropped their debut album, Buried In Violence, and right from the first song, Kill. You. Now., that they mean business. Straight away my ears were attacked by a brutal riff and some seriously intense vocals. It reminded me a lot of Machine Head, with a similar shouty-clean style to Rob Flynn. One thing I noticed about this and the other songs was the jaw-dropping guitar solos - there's a lot less solos in metal than there used to be, and its nice to hear the guitarist shredding it up every so often. Annihilation and As Your Kingdom Falls follow a similar kind of sound, with pounding riffs from start to finish, and again I definitely heard a lot of Machine Head influence in the cleans. The next song, Blood Coated Concrete, has what's probably the best riff on the album, before it gives us a taste of the band's more melodic side, which they are just as amazing at as the more riffy stuff. Monster also has a great riff. In fact, I'd go so far as to say it's an absolute Monster of a riff. (I'm sorry.) The title track starts off a bit differently, with the bass starting off, before the guitar comes in, and then finally the vocals and high-speed drumming comes in. But one of the problems about this album is that all the songs pretty much follow the same structure; this one's a bit faster, there's some slower ones, but not a lot of difference between the songs. Vindicare, an interlude track, slows things down a bit, before Nemesis destroys all the nice-ness with some more tasty riffs. Revolution of Destruction goes in more of a thrashy direction, and has some more melodic cleans, that we haven't really heard since the start of the album. After Unholy Manipulartor, another one full to the brim with savage riffs, we finally hear that slower, more melodic sound that Blood Coated Concrete gave us a tiny teaser of on the final track, Perry Mason. The slowed-down melodies are a nice way to end the album and calm down after all the heavy-ness. I would've liked to here a bit more of this sound, because although we all love a nice riff, it's better (in my opinion at least) to have a bit more of a variety, and slow it down sometimes. That was probably this album's only negative; that most of the songs followed the same formula and weren't very different. Apart from that, a great album!